Wryn Russell lights a candle in the memory of her family members. Photo by SaraH Phillips. A candlelight vigil was held Thursday evening for four members of the Evans and Nyte families, who died in an apartment complex just days ago. The largest sanctuary in Guthrie was not large enough as hundreds attended the vigil inside Community Church. 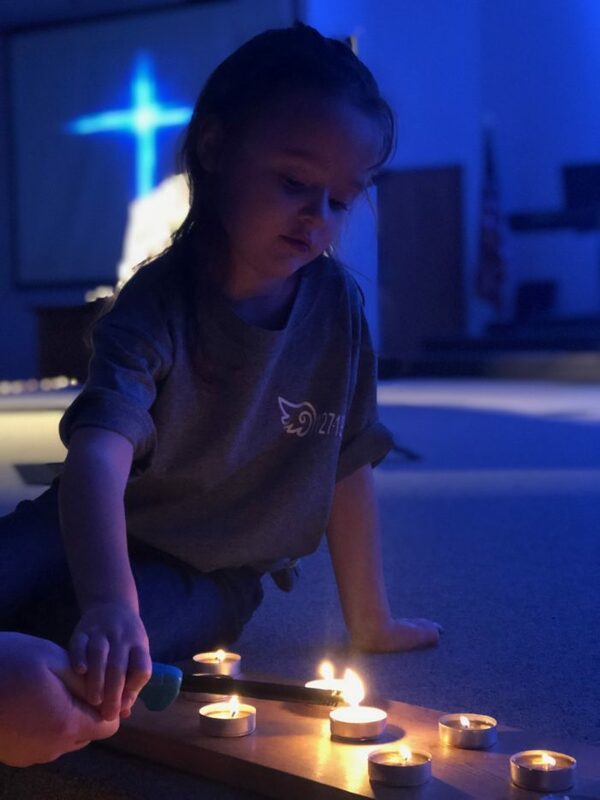 With low lighting and soft music in the background, Paisley Evans (4), Bentley Evans (7), Carson Nyte (12), and the children’s aunt Melissa Evans (34) were celebrated and remembered as many shared their memories of the four. “We’re going to make sure and focus on their character, because that’s what people in Guthrie remember them by,” family member Douglas Russell said moments before the vigil began. There will be a car wash fundraiser held at Guthrie High School on Sunday, February 3 from 1 p.m. to 6 p.m. All proceeds will help the family members of the victims. In addition, a gofundme page has been setup for the family and a memorial account (Evans – Nyte Memorial) at BancFirst in Guthrie. The funerals will be held at 2 p.m. on Saturday inside Community Church. One Response to "Watch: Community rallies around grieving families at candlelight vigil"